An online game called “Smoke-free meals” was unveiled in Beijing on Wednesday as part of an event to encourage public input in the city’s tobacco control regulation. Netizens can follow “Smoke-free Beijing” on WeChat and invite three friends to join the game, so the four can have a dinner together. All groups of four will take part in a weekly lottery for five weeks from Friday, and winners will be given free meals for four or vouchers for 50 or 100 yuan, at smoke-free restaurants in Beijing. 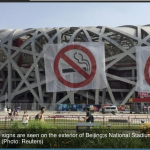 The event, called “Thank You for Not Smoking”，was jointly launched by the Beijing Tobacco Control Association, the World Health Organization and the Campaign for Tobacco Free Kids. The event also included displaying human-shaped boards at restaurants across Beijing to acknowledge the contribution of communities and volunteers who helped comply with the regulation, including waiting staff, security guards, nurses and student volunteers. Smoking in restaurants in Beijing has declined from 38.1 percent before the regulation was enforced on June 1 to the current 14.8 percent, according to the Beijing Tobacco Control Association. The regulation bans smoking in all indoor public places and work places as well as many outdoor public places.